The Tower of David Museum has long been a place to learn about Jerusalem’s 4,000-year history. Now, it’s also a destination to experience cutting-edge 21st-century technology. ​In January, the Tower of David Innovation Lab is slated to open as a collaborative hub for virtual reality (VR) and augmented reality (AR) projects. The museum’s partners include dozens of Israel’s leading tech companies. Together, they aim to develop digital solutions to enhance visitors’ experiences at the tower as well as at other museums and national heritage sites around Israel and the world. ​“The technology available to us now allows us to bring to life the past and enables us to give a voice to the ancient stones of Jerusalem that have witnessed the builders of Jerusalem—kings and conquerors, pilgrims and peasants,” said museum director Eilat Lieber. ​The $775,000 lab is jointly funded by the museum and the Jerusalem Development Authority. 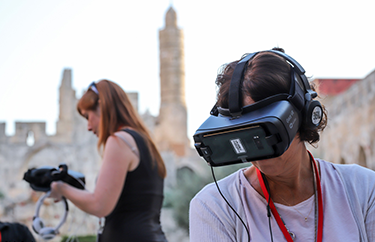 ​Located just inside the Old City’s Jaffa Gate, the museum will act as a beta testing site for new applications of VR and AR. On any given day, a variety of different technologies will be available for visitors to try out. Some will engage audiences remotely online from anywhere in the world. ​Aros, a participating AR company, is developing a demo whereby visitors wearing specialized goggles would look at specific outdoor areas within the museum and get historical information about them. Similarly, they could look out from vantage points atop the tower and see information about Jerusalem landmarks.